53 entries categorized "Lori Hacking"
(CNN)—Dental records confirmed that human remains found in a Salt Lake County landfill Friday are those of Lori Hacking, a Salt Lake Police spokesman told CNN. Lori HackingThe "heavily decomposed" remains were found Friday morning by people searching for the body of the 27-year-old Utah woman missing since July 19, Salt Lake City Police Chief Rick Dinse said. Officers from several police agencies and cadaver dogs have searched the landfill about four days a week since August. It took just a few hours Friday before investigators were certain the remains were those of Hacking, whose husband has admitted to fatally shooting her, said Salt Lake Police spokesman Phil Eslinger. Mark Hacking, Lori's husband, said he shot his wife in the head with a .22-caliber rifle as she slept and wrapped her body in garbage bags before disposing of it in a garbage bin, Salt Lake District Attorney David Yocom said in August. Hacking was charged in August with his wife's murder, along with three counts of obstruction of justice. An arraignment is scheduled for October 29. Deputy District Attorney Robert Stott said finding Lori Hacking will strengthen the prosecution's case. Yocom said Hacking confessed to his two brothers while he was being treated at a mental ward of a hospital in the days after the killing. Hacking also said he disposed of the body, the murder weapon and the mattress in separate garbage bins. The district attorney said Hacking decided to kill his wife after she discovered he was not enrolled in medical school in North Carolina, where the couple had planned to move. "The defendant stated that in the early morning hours of July 19th, he walked into the bedroom where his wife slept and shot her in the head with a .22-caliber rifle," Yocom said. "He further stated that he wrapped Lori's body in garbage bags, placed the body in the Dumpster at approximately 2 a.m. And then, he further stated that he disposed of the gun in another Dumpster." According to Yocom, Hacking also said he used a knife to slice up the mattress and discarded it in another garbage bin. The mattress and knife have been recovered. If convicted, Hacking could be sentenced a minimum of five years to life in prison on the murder charge and one to 15 years in prison for each of the three obstruction charges. 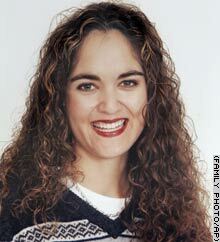 Also just saw an update on the KSL-TV main page: Police Confirm Remains Belong to Lori Hacking. UPDATE 16:14: The Salt Lake Tribune's just put a link to their own story about the discovery on their main page. Break in the Lori Hacking case? I just heard a brief news tease on the radio, the discovery of what may be human remains at the Salt Lake County Landfill. As soon as I see something on one of the local newspapers' web sites, I'll post more detail. This situation began Friday morning, but this is the first time the Trib's online edition has deigned to include a photograph of the boy in one of its articles. A story in yesterday's online edition included a view of a photo that was part of a MISSING poster taped to a hiking-trail sign or something similar. Lori Hacking's "missing" stories included direct photographs of her (several different shots, in fact) from the first day. I wonder why the differences in coverage? I've included the entire text of the story, along with the photos in their approximate locations from the Trib's story page. Wearing a bulletproof vest and flanked by seven bailiffs, Mark Douglas Hacking came to court for the first time Monday but did not speak as his preliminary hearing was scheduled for Sept. 23. Mark Hacking, charged in the murder of his wife Lori Hacking, appears before judge William W. Barrett in Salt Lake City court on Monday morning alongside his lawyer D. Gilbert Athay for a brief scheduling hearing. Francisco Kjolseth, The Salt Lake TribuneHacking, 28, is charged with first-degree felony murder for allegedly killing his wife, 27-year-old Lori Hacking. In an interview after court, defense attorney D. Gilbert Athay said there will be no quick resolution of Hacking's murder case. "In all cases, plea bargains are something that are talked about, but we're certainly not in that position right now," Athay said. "That decision will be made after a complete and full review of the discovery" evidence assembled by prosecutors, he said. "I don't even have it all, and probably won't for another three weeks. "Until all the discovery has been examined, it's totally improper to be talking about plea negotiations." Athay said he is also trying to find out as much about Hacking as possible. "We need to know—from the time he was a little boy until today—everything about him," Athay said. "Who is this guy? What is he all about?" Of particular interest to Athay is a head injury Hacking suffered earlier in his 20s, during a fall while working on a roof, because evidence of brain damage could support an argument for reduced charges. After the hearing before 3rd District Judge William Barrett, prosecutor Robert Stott told news reporters he and Athay were not discussing a plea. "The only thing we've negotiated about was the preliminary hearing date," he said. Mark Hacking, charged in the murder of his wife Lori Hacking, leaves court in shackles following his brief scheduling hearing before judge William W. Barrett in Salt Lake City court on Monday morning. Francisco Kjolseth, The Salt Lake TribuneThe purpose of a preliminary hearing is to determine whether there is probable cause to believe a crime occurred and that the defendant committed it. According to charging documents—which rely heavily upon Hacking's confession to his brothers—Hacking shot his wife in the head as she slept in their Salt Lake City apartment on July 19. Hacking allegedly disposed of her body in a Dumpster, which was picked up that morning by a trash hauler and dumped at the Salt Lake County Landfill. Police planned to continue to search the landfill for Lori Hacking's body Monday night, the 15th day that cadaver dogs and police officers have scoured the 2-plus acres of garbage that were cordoned off July 20. The search will be discontinued until Friday, primarily to allow the dogs to rest. Prosecutors believe Hacking killed his wife because she had discovered his numerous lies, including false claims that he had graduated from the University of Utah and been accepted to a North Carolina medical school. Hacking's use of a bulletproof vest during his court appearance Monday was unusual, said defense attorney Stephen McCaughey, who has represented several people charged with capital murder. "I've never had a defendant brought to court in a bulletproof vest," he said. But Salt Lake County Sheriff's Sgt. Rosie Rivera called it "standard procedure" in a high-profile case where the defendant is also in protective custody at the maximum-security area of the jail. Inmates are placed in protective custody when they are perceived to be a danger to themselves or could be targeted by other inmates because of intense media coverage. "They are in their own cell and are let out one hour per day to take care of their business—shower or make phone calls. 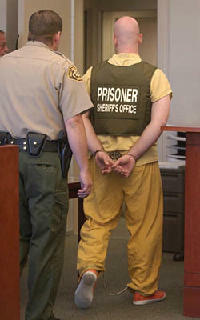 And when they go to court appearances, medical appointments or anything else, they wear bulletproof vests," Rivera said. She acknowledged there have been few cases requiring such extreme precautions. "But this [Hacking] was a murder case that went nationwide," she said. Athay said he knew of no specific threats against Hacking's life, but said the vest was "probably a smart thing." Hacking showed no expression Monday. But while coming and going from the courtroom, he scanned the gallery, apparently looking for a familiar face. No members of his family attended the hearing. Athay said he met with Hacking late last week, as well as before court Monday "to prepare him. He's never been in a courtroom before in his life, except on video" for an arraignment last week. Athay added: "Under the circumstances, he's doing very well." He said they had not discussed the Saturday memorial service for Lori Hacking, but said Hacking has some television access and may have seen news coverage. Athay said he will not be asking for a reduction in Hacking's $1 million, cash-only bail. "In a case like this, you're wasting your time," he said. Reduced charges a possibility because of this head injury, when it seems plainly evident Hacking was in full possession of his faculties when he shot his wife and then disposed of her body, the mattress on which he'd killed her, and the murder weapon? To say nothing of then trying to replace the mattress and reporting his dead wife missing, then maintaining the fiction for a period of days? Wearing a yellow jail jumpsuit and staring straight ahead without expression, Mark Douglas Hacking was arraigned this morning on charges he killed his wife and disposed of her body in a Dumpster. Hacking—who is being held on $1 million cash bail—appeared before 3rd District Judge L.A. Dever via a closed-circuit television link with the Salt Lake County Jail. Dever asked Hacking to verify his name, then read the charges and set a scheduling hearing for Aug. 16 before another judge. Following the two-minute hearing, defense attorney D. Gilbert Athay declined to answer any questions. "Nothing today," Athay said, flashing a tight smile as he strode briskly past a horde of news reporters. Hacking, 28, is charged with first-degree felony murder for the June 19 slaying of his sleeping wife, 27-year-old Lori Hacking, at their Salt Lake City apartment. Hacking is also charged with three second-degree felony counts of obstructing justice for allegedly using three different Dumpsters to dispose of the woman's body, a .22-caliber rifle and the mattress on which she was sleeping when killed. Mark Hacking shot his wife in the head with a .22-caliber rifle as she lay sleeping, rolled her body up in garbage bags then disposed of her in a Dumpster at the University of Utah, according to a criminal complaint filed this afternoon in Salt Lake City. Hacking, 28, was charged with one count of first-degree felony murder and three counts of obstructing justice, a second-degree felony, in a complaint filed in 3rd District Court. The charges based on a confession Hacking made to his brothers and corroborated with physical evidence at the crime scene allege that Mark Hacking killed Lori Hacking, 27, after they argued over his lie about being accepted at medical school in North Carolina. "Lori's dead and I killed her," Mark Hacking told his brothers. Now in the Salt Lake County Jail in lieu of $1 million bail, Mark Hacking, is scheduled to make a brief court appearance Tuesday to hear the charges formally read to him. In a news conference Monday, Salt Lake County District Attorney David Yocom discussed new details about the case, which has attracted national attention. Yocom said blood found in the Hackings' apartment and her car was matched through DNA testing to Lori Hacking. The couple argued Sunday night about Mark Hacking's lies regarding his medical-school plans at the University of North Carolina, according to the story Mark Hacking told his brothers. Lori later went to bed and Mark stayed up, playing Nintendo for about an hour. He then "came across" his .22-caliber rifle and shot her in the head, according to the charges. Mark Hacking used a knife to cut the pillowtop of their mattress off, then wrapped the body up in garbage bags, put her body into her car and transported to the University of Utah about 2 a.m., Yocom said. He told his brothers he disposed of the gun and mattress piece in two other Dumpsters. Police recovered the mattress from a Dumpster in a nearby church parking lot. They have not recovered the murder weapon. Although Lori Hacking was reportedly pregnant, police do not have her body and were unable to confirm it. As a result, prosecutors do not have evidence to charge Mark Hacking with capital murder, which carries a possible death penalty. Yocom said it is unlikely that finding the body after three weeks time will yield sufficient evidence to prove whether Lori was pregnant. Although police say they will search for Lori's body indefinitely at the Salt Lake County Landfill, Yocom said it is not absolutely necessary. "We have an excellent case," he said. If convicted, Mark Hacking faces five years to life in prison on the murder charge, and one to 15 years on each of the obstruction charges. Three weeks to the day since Mark Hacking called police to report his wife's disappearance, the 28-year-old Salt Lake City man awaits a murder charge—expected to be filed by 5 p.m. today—from his cell at the Salt Lake County Jail. Hacking was arrested and booked into the jail's mental health unit on Aug. 2 based on evidence gathered in the disappearance and presumed death of his wife, Lori Hacking. On Sunday, he was moved from the unit, where he had been placed on suicide watch, to a maximum security pod. He also was given visiting privileges, which officials said are scheduled to begin Thursday. Hacking remains held on $500,000 cash bail. Third District Judge Anthony Quinn last Thursday granted prosecutors an extension of the deadline to file formal charges, after they said they needed more time to review evidence. A murder charge could earn Mark Hacking a sentence of up to life in prison. Capital murder charges could be filed if prosecutors can prove Lori Hacking was pregnant—or can prove other factors that would aggravate a murder charge—but that prospect is clouded by the failure so far to find a body. Search crews aided by cadaver dogs finished a grueling five-day stint at the Salt Lake County landfill Sunday night after sifting through more than 3,000 tons of garbage where Lori Hacking is thought to be buried. The dogs will be allowed a few days rest before returning to the site, according to Salt Lake City police Detective Dwayne Baird. Sunday marked the ninth day police have searched the landfill since shortly after learning of Lori Hacking's disappearance. She was last seen late Sunday night, July 18, with her husband at a Maverick gas station near the couple's Salt Lake City apartment. 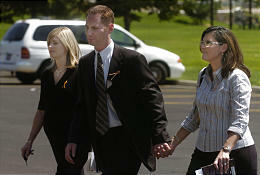 Mark Hacking reported his wife missing around 10 a.m. the next morning, saying he had already begun searching for her. Witnesses and a credit card purchase receipt later placed him shopping for a new mattress at that time at a South Salt Lake furniture store. Police and thousands of volunteers canvassed areas of the Salt Lake Valley and surrounding foothills in hope of finding Lori Hacking alive. A probable cause statement filed by Salt Lake City police in connection with Mark Hacking's detention alleged that blood and a knife were found in the Hackings' apartment and that other blood evidence was found in the woman's car. The same document also alleged Hacking had confessed to a "citizen witness," to whom he admitted killing his wife in her sleep and disposing of her body in a Dumpster. Mark Hacking's brother Scott told The Salt Lake Tribune that Mark admitted to the crime in statements to him and brother Lance on July 24. A memorial service for Lori Hacking is planned for Saturday at 11 a.m. at the Windsor LDS Stake Center, 60 E. 1600 North in Orem. Lori Hacking's family asks that in lieu of flowers, mourners contribute to the Lori Hacking Memorial Fund at any Wells Fargo Bank or by mail to Thelma Soares, 1501 N. Canyon Road, Provo, UT, 84602. With the gruesome facts surrounding Lori Hacking's death finally revealed, her father on Friday lashed out against prime suspect Mark Hacking, calling his son-in-law's alleged actions "disrespectful," "gutless" and "monstrous." 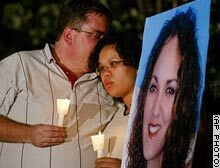 Eraldo Soares, of Fullerton, Calif., called on the criminal justice system to afford "appropriate justice" for Mark Hacking, who confessed to his brothers that he killed Lori in her sleep and disposed of her body in a Dumpster. "As the facts about my little girl's death emerge, I am outraged," he said. "The innumerable lies she was told by her husband for years on end were selfish and shameful. The cowardly way in which she and her baby were brutally murdered in cold-blood while she slept is despicable. The gutless attempt at covering up this monstrous act is appalling. It is difficult to imagine a more disrespectful way of disposing of her remains." Even as evidence became public indicating that Mark Hacking had lied about his whereabouts on July 19, the day his pregnant wife died, the Soares and Hacking families continued to publicly stand together. In a statement made on July 24, Soares said he loved his son-in-law but questioned his honesty. That same evening, Hacking's brothers say, Mark Hacking confessed to them. It is unclear when the Soares family learned of the confession, but the Hacking family said communication was made "quickly" and Soares had not spoken publicly since. In other news Friday, a memorial service for Lori Hacking has been scheduled for Saturday, Aug. 14, at 11 a.m. at the LDS Windsor Stake Center, 60 E 1600 North, Orem. A display honoring Lori's life will be in the Relief Society room of the church from 9:30 am until 11 am. In lieu of flowers, memorial contributions can be made to the Lori Hacking Memorial Fund at any Wells Fargo Bank or by mail to Thelma Soares, 1501 N Canyon Road, Provo, UT 84602. I figured it'd be Lori Hacking's father who would switch sides, as it were, and denounce Mark Hacking at some point. I'm surprised it took this long, in fact. A Salt Lake Tribune article for which I failed to grab the link; it’s since disappeared into their paid-access archive. He told his family he killed his wife. Now his family says Mark Hacking is ready to accept the consequences. In a telephone conversation from jail Wednesday night, Hacking reportedly talked to his father about his willingness to help investigators, despite its possible effect on his upcoming court case. Prosecutors could file capital-murder charges in the case if they can prove an aggravating circumstance, such as Lori Hacking’s reported pregnancy. They now have more time to make that determination, after 3rd District Judge Anthony Quinn granted an extension Thursday following a request from the Salt Lake District Attorney’s Office. Prosecutors, who say they have not had enough time to review the evidence, were given until 5 p.m. Monday to file charges against Mark Hacking, or he could be released. United by grief and a desire to uncover the truth about Lori’s disappearance, the Hacking and Soares families have formed an unusually stable bond. 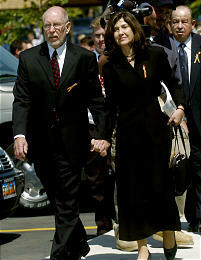 When Mark’s credibility came into question early in the search for Lori, the families were side by side at nearly every public appearance. As information mounted about Mark Hacking’s actions on July 19, the morning Lori vanished, her father, Hareld Soares, revealed that he doubted his son-in-law’s story. Even then, Soares told him that his love would not diminish. “I told him, ‘I have compassion and love for you,’“ Soares said at the time. And Douglas Hacking called Lori’s mother, Thelma Soares, shortly after learning of his son’s confession to family members July 24. Scott and another brother, Lance, heard Mark Hacking’s confession during an 11 p.m. meeting on July 24 at University Hospital’s psychiatric ward. During that meeting, Mark admitted that he killed Lori while she slept in their apartment and later threw her body into a nearby Dumpster. The decision to tell police about the confession was excruciating for Scott and for his father, who watched his son wrestle with the choice. Initially, Scott and Lance Hacking informed their parents only that Mark had told them where Lori’s body had been placed. 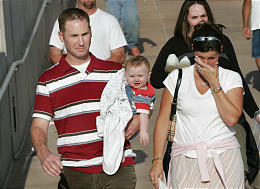 Douglas Hacking and his wife, Janet, drove Scott to the police station the following night so he could inform police. Now, Scott said, he wants to bring his brother back into the fold. Douglas Hacking said that process started when Mark decided to confess, though he was pressured by Scott and Lance earlier in the day. The family allowed the search to continue for a few days following the reported confession because they were concerned about the “reliability of Mark’s information,” Douglas Hacking said. “He had lied before and he lied straight to me,” Douglas said, referring to an earlier conversation when he asked Mark if he had anything to do with Lori’s disappearance. 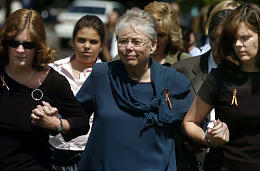 The family also expected police to call off the search on July 25, but 1,800 volunteers arrived. The family eventually decided to call off the searches themselves, saying they would limit the search to all-terrain vehicles, horses and airplanes in rugged area. Those searches never materialized. One question the family can’t answer is why Mark committed the alleged murder. Scott Hacking said he plans to seek no further information about the alleged murder from his brother, per instructions from Mark’s defense attorney, Gilbert Athay. While he was writing his jailed son a letter, Douglas Hacking received a phone call from Mark late Wednesday. They had a 15-minute conversation that focused primarily on the conditions in the mental health unit, where Mark Hacking is on suicide watch, but also touched on his decision to assist investigators. On Monday, Hacking sat in his cell naked with only a blanket. The next day he received a jumpsuit and on Wednesday his jailers gave him a pair of underwear. Officials at the jail say those are the three stages suicidal inmates are placed in depending on a daily consultation with a psychiatrist. It also shows that Mark Hacking’s emotional state is settling. Athay on Thursday did not return a phone call requesting comment. He will have to wait until police finish compiling the case against Hacking to hear what charges prosecutors will levy. Thursday’s court motion by prosecutors to extend the deadline for filing charges states that Salt Lake City detectives “just returned” from Texas, where they were interviewing a witness—most likely Lance Hacking, who lives in Austin. Police also are “in the process of compiling transcripts of witness interviews, and are awaiting test results from the crime lab,” states the motion. Without the extension, prosecutors would have been forced to file charges by the end of business Thursday or release Hacking, who was booked into jail Aug. 2. Mark Hacking is being held on a $500,000 cash-only bail. Detectives, meanwhile, searched the Salt Lake County landfill for a sixth night Thursday, looking for Lori Hacking’s body. A backhoe being used in the effort was so deep into the 18-feet-tall pile of trash that it was barely visible from the road that runs alongside the dump. The search of the 2-acre area may take weeks, but detectives say they are hopeful of finding her remains with the assistance of Duchesne County’s cadaver dogs. It's strange. I've posted about Lori Hacking about twice a day since her disappearance on July 19, which is odd because the case doesn't captivate me anywhere nearly that much. From the third day when Mark Hacking's education lies came to light, I've posted mainly because it's happening in my hometown—the town where I was born, grew up, and am living again after two years in other cities—and because after I made the first couple of posts, I saw a lot of hits about it from search engines. I felt somewhat responsible for providing an easy reference for folks who may have stumbled over my site while searching for news or information about Lori Hacking. Anyway, below the fold are clippings of two stories from the Salt Lake Tribune, along with links to the Tribune's reference section on the case. If you know of any other good resources for Lori Hacking-related material, please post in the comments section so my archive will be as complete as possible. Stories from The Salt Lake Tribune and CNN.com discussing the families' fax to Salt Lake media informing searchers their efforts can end based on information the families have received from Mark Hacking.